The beachside suburb of Bronte is an area serviced by Randwick Electrical. Whether you need to update the outdoor lighting for your beachfront residence or get the wiring done for a new development, Randwick Electricians will help make the process straightforward and stress-free. It’s the truth: most of our customers continue to use Randwick Electrical services for life. That’s because they find our service to be efficient, friendly and reliable. As a company, we enjoy building long-term relationships with repeat customers. It helps us understand every individual’s unique situation and provide the best advice and service that we can. Call Randwick for your next electrical upgrade or repair—it’s likely that you’ll keep us on speed dial to solve future problems that come up! 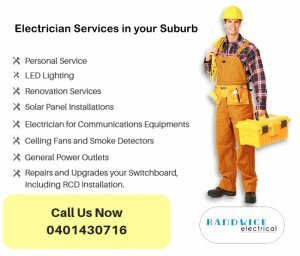 If you need emergency electrical services in the Bronte area, the electricians at Randwick are on-call to help you gain control of the situation. Our employees are friendly and do well under pressure. We never take shortcuts—even in an emergency. Instead, we get the job done properly. We know how frustrating it can be to experience an emergency. Let us come in and make everything right. We’re proud to be the residential and office electricians of choice for Bronte and beyond.